Photoperiod manipulation cage lighting.Pisces 400 & Pisces 365 are submersible, pendant, fish cage illuminator with an outstanding record of reliability season after season. The luminaire embodies a 400 (or 365) watt, metal halide lamp, offering an output closely resembling natural daylight. It is self-contained, streamlined and corrosion proof. 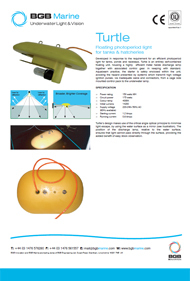 (Supplied with 25m cable as standard - extra length is also available). Photoperiod manipulation cage lighting. 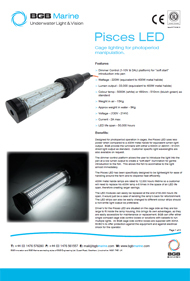 The Pisces LED has finished full testing and is now available to the market. The Pisces LED has a dimmer control, longer lasting lifespan and more economical to run than traditional metal halide versions. 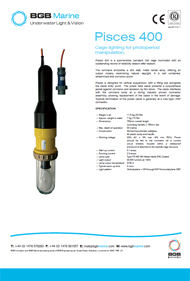 Pisces 1000 is a submersible, pendant, fish cage illuminator, the design of which is based upon the Pisces 400 which has an outstanding record of reliability, season after season.The luminaire embodies a 1000 watt, metal halide lamp. It is self-contained, streamlined and corrosion proof. (Supplied with 25m cable as standard - extra length is also available)Pisces is designed for vertical suspension, with a lifting eye built into the housing. The power feed cable presents a polyurethane jacket for protection against corrosion and abrasion by fish stock.For further details and technical specification see the PDF section. 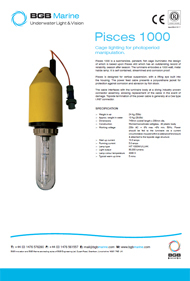 Developed in response to the requirement for an efficient photoperiod light for tanks, ponds and raceways, Turtle is an entirely self-contained floating unit, housing a highly efficient metal halide discharge lamp together with associated control gear. 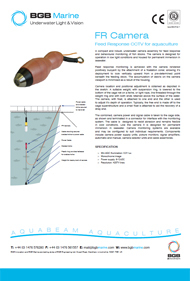 In keeping with standard BGB Marine practice, the starter is safely enclosed within the unit, avoiding the hazard presented by systems which transmit high voltage ignition pulses, via inadequate cable and connectors, from a cage side mounted control pack to the underwater lamp.Turtle's design makes use of the critical angle optical principle to minimise light escape, by using the water surface as a mirror. 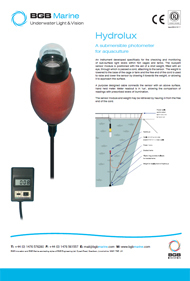 The position of the discharge lamp, relative to the water surface, ensures that light cannot pass directly through the surface, conferring the added benefit of easy stock observation.